We’d love your help. Let us know what’s wrong with this preview of Farmacology by Daphne Miller. Family physician Daphne Miller long suspected that farming and medicine were intimately linked. Increasingly disillusioned by mainstream medicine's mechanistic approach to healing and fascinated by the farming revolution that is changing the way we think about our relationship to the earth, Miller left her medical of What can good farming teach us about nurturing ourselves? Family physician Daphne Miller long suspected that farming and medicine were intimately linked. Increasingly disillusioned by mainstream medicine's mechanistic approach to healing and fascinated by the farming revolution that is changing the way we think about our relationship to the earth, Miller left her medical office and traveled to seven innovative family farms around the country, on a quest to discover the hidden connections between how we care for our bodies and how we grow our food. Farmacology, the remarkable book that emerged from her travels, offers us a compelling new vision for sustainable health and healing—and a wealth of farm-to-body lessons with immense value in our daily lives. What can rejuvenating depleted soil teach us about rejuvenating ourselves? To ask other readers questions about Farmacology, please sign up. I got to hear Ms Miller in person before I read her book. That the woman speaks passionately of both "tilth" and "chi" warms me and all my microbes. I remember once being on a church committee for health and envisioning bringing a farmer to speak to us. The doctor on the committee was livid: what would any farmer know about health? We go with Ms Miller to a kind of no-man's land, where that doctor on the committee and no doctor has gone in recent times, to a place between two fields of inquiry. I I got to hear Ms Miller in person before I read her book. That the woman speaks passionately of both "tilth" and "chi" warms me and all my microbes. I remember once being on a church committee for health and envisioning bringing a farmer to speak to us. The doctor on the committee was livid: what would any farmer know about health? We go with Ms Miller to a kind of no-man's land, where that doctor on the committee and no doctor has gone in recent times, to a place between two fields of inquiry. I think some farmers know that place well, but, doctors? ..."'you can't just focus on the kids. The unit is really the family and the community.' ...After our conversation, I thought about Julie Mennella's final message: Producing healthy eaters is a job for an entire family, an entire community. What she proposed was much more involved than the USDA's 'Five a day' or 'Fruits and Veggies: more matters' campaigns, which simply urge parents to put more produce on their children's plates." The multifaceted, community approach needed for healthy eating is much like approaches the farmers we visit with Ms Miller have instituted on their farms, thinking of their farms as a systems, less testing and inputs of any kind, and honoring the microbial life of the soil. I'm excited about the calves able to grow up with their mothers (instead of being weaned and bottle fed) and all the other ways farmers are listening to what nature requires of them in their specific places and finding what nature helps them to do. Yes! Soil IS the placenta of life and health. I've been interested in sustainability and nutrition for several years and it's this book that finally got me over the hump to planting my first garden. I learned about the idea of a biodynamic farm where all parts depend on one another. It was especially interesting how Daphne connected the process of how soil is healthy to ways in which the body can achieve health. The structure of this book worked well in that there would be a section about farm life and I've been interested in sustainability and nutrition for several years and it's this book that finally got me over the hump to planting my first garden. The structure of this book worked well in that there would be a section about farm life and then a section that followed in which the lessons of the farm were applied to the health of the human body. Going to see what a mindfulness program is. A wow stat that reminds me of what I learned in the documentary film, Food INC: There are two major egg hatcheries in the United States today while there were over 13,000 hatcheries in the 1930s. A new idea to me: cancer as a chronic condition to be kept in check rather than something to be cut out or poisoned. I'd like to ask Daphne in what sort of cases she favors surgery. Breast cancer comes to mind right away. Interesting theories that I want to take a harder look at. Tampa's Moffitt Cancer Center is specifically mentioned. Here's a sentence I'd like to think about how to apply to undergraduate education: "So in 2007, when he was offered the job of revamping the radiology department at Moffitt, he accepted on the condition that he could dedicate a portion of his workweek to building and directing a mathematical oncology "collaboratorium," which would take a multidisciplinary approach to understanding and treating cancer." I tried to think about how an interdisciplinary undergraduate major could be designed. The first thing that comes to mind reading the above is that it could be problem/solution oriented. These programs exist. My reading of this book will prompt me to investigate further. I just finished this book and my heart is racing with excitement because I know that it will influence me for the rest of my life. I've been doubting my career path because I'm applying to medical school but I'm also incredibly passionate about sustainable agriculture and deep ecology. This book was the perfect fusion of these interests and gave me an unprecedented hope that there are like-minded doctors in the world who are pushing for healthcare to rise above the reductionism that plagues mode I just finished this book and my heart is racing with excitement because I know that it will influence me for the rest of my life. I've been doubting my career path because I'm applying to medical school but I'm also incredibly passionate about sustainable agriculture and deep ecology. This book was the perfect fusion of these interests and gave me an unprecedented hope that there are like-minded doctors in the world who are pushing for healthcare to rise above the reductionism that plagues modern medicine. Though this book resonated with me personally, I think other people might enjoy it too. It is a exploration of what sustainable agricultural practices can teach us about sustainable health practices. Its amazing how similar conventional medicine is to conventional agriculture and Dr. Miller highlights these similarities. However, most of the book delves into her experiences at family farms and community gardens around the United States and she sees that many of these places hold the key to a more holistic approach to health. Dr. Miller shows us how thinking like a family farmer can help us understand our body and our own health predicaments. Being plant based, I went into this book skeptical because I knew it supported animal agriculture, even if on a humane level. But I found the bigger picture and information extremely valuable. Wow! Now to find a physician who practices "medical ecology" to begin the true path to wellness! Everything written in this work makes good, simple sense. And, yes, we focus too much on anti-aging & not on beauty, which is unproductive, ridiculous, and a waste of time! We need to think more about our connectivity to nature in order to be physically, mentally, and spiritually whole. This is a very interesting look at how we should be approaching health - treating the whole being not just the "disease" and how the foods we consume and the environment we live in impacts our health. Well worth a read! I read the first couple of pages, was unimpressed, and set it aside for a while. Picked it back up again and within a few paragraphs, the book suddenly became extremely interesting and engaging. Great information about health, soil, interconnectedness, and lots of other biological and ecological ideas coming together. This was so exciting to read. I want to read all her references, and go to all the farms. Dr. Miller is a medical doctor who grew up the child of two urban parents turned (unsuccessful) farmers. For her, an interest in farms and an interest in medicine were linked - watching sick, suffering livestock as a child. She forgot this initial spark of interest until she picked up a book called The Soul of Soil - she was interested in "the detailed description of a soil ecosystem where the nutrient exch This was so exciting to read. I want to read all her references, and go to all the farms. Dr. Miller is a medical doctor who grew up the child of two urban parents turned (unsuccessful) farmers. For her, an interest in farms and an interest in medicine were linked - watching sick, suffering livestock as a child. She forgot this initial spark of interest until she picked up a book called The Soul of Soil - she was interested in "the detailed description of a soil ecosystem where the nutrient exchange between soil, microbe, and plant sounded curiously similar to what takes place in our own intestines." That book ultimately inspired her to look to agriculture for models of complexity care to be applied to medicine - rather than focusing on one issue at a time to solve. "But most of the time our health needs are more complex and dynamic, just like the soil, and most of what ails us today - depression, anxiety, diabetes, heart disease, fatigue - is multifactorial, chronic, and not well served by a static and highly focused approach. On one level there is our physical makeup: our DNA and the hormones, nerves, and other tissues that manifest this coded information. These structures and chemicals have an imbalance that can be measured and corrected - such as blood sugars, blood pressures, or hormone levels. But addressing these discrete issues, while important, is only one piece of the puzzle and rarely translates to optimal health." Each chapter is focused on a different farm. Each farm has an illustration of its set-up. She interviews farmers and medical researchers and cites studies to try to come to a full, complex understanding of health. It's hard to summarize, because I don't want to lose any nuance captured by combining these different approaches. The real fun is watching all these ideas collide and sparking insights - for which you just have to read the book. - ear drops made of olive oil infused with mullein and garlic - helped an ear infection as long as there was no pus or discharge from the ear. - Stress - low grade stress but chronic stress is not good. vs. others who have high stress for a little amount of time. - chickens and their stress level is very important to keep low. - Integrated pest management is amazing! Like most books on health, soil, and the food system, Farmacology is the hero’s journey of a sympathetic outsider who profiles the lives and tactics of various food renegades, extols the reader to eat real food it’s good for you something something farmers markets, and learns along the way that it was really all about friendship. Doesn’t mean it’s not worth reading (or going to farmers markets, because QFCs are dens of food depression), it’s just that I’ve read this book before and I think they Like most books on health, soil, and the food system, Farmacology is the hero’s journey of a sympathetic outsider who profiles the lives and tactics of various food renegades, extols the reader to eat real food it’s good for you something something farmers markets, and learns along the way that it was really all about friendship. I found this book very interesting. I like that this doctor went looking for a way to change the way she treats her patients...looking at the whole person and not just the part that ails them. Her connection between farming and healthcare are interesting and thought provoking and I am now looking for a doctor who thinks like an ecologist. I highly recommend you read this book for your health. Fascinating book. I’d checked it out from the library, but I will be purchasing a copy to have on hand. The perspective in this book is so fresh and timely. I have nothing profound to say, but do highly recommend it to others. We, as humans, are undeniably connected to the natural world. The author does an incredible job diving in to that concept with expertise and honesty about her thoughts during this learning process. What an important book that gave me lots to think about. During this past year I have been dealing with breast cancer while at the same time pursuing my education in horticulture and horticulture therapy. So much of this book resonates with me as I link my health and horticulture/nature together. I'm keeping it close at hand as I know I will go back and read chapters again. Similar to the views shared in some of Michael Pollan’s books, this book looks at what we put in our bodies and the global impact both environmentally and medicinally. I love that the author provides steps on what the reader can do that makes a difference. She breaks it down so it doesn’t seem so insurmountable. This book was life changing. I would put it in the same essential reading category as "The Omnivore's Dilemma" and "Mad Cowboy" (two books that dramatically changed my worldview and view of the integrity of what I consume). If you care at all about your health (or even if you don't), READ IT. I was amazed to know how similar was a human body to the soil and how microbes help both and also how the food habits of pregnant mothers affect food habits of a baby. One of the most well written, enjoyable, and informative books I have read in a great while. Every page in this book is chalk full of useful, well researched, and eloquently described information. A thoroughly enjoyable read. Amazing book! Forced me to have some serious thoughts on what I am injesting. Need to make some seriously better choices in the future. I learned so much. “Medical ecologist” is the kind of doctor I will now search for, with my “personal health map” in hand - detailing my ecological health. Anecdotal and relevant. Very interesting nonfiction. An interesting look at lessons doctors can learn about treating the human body by studying how farmers, vintners, and herbologists manage their land. 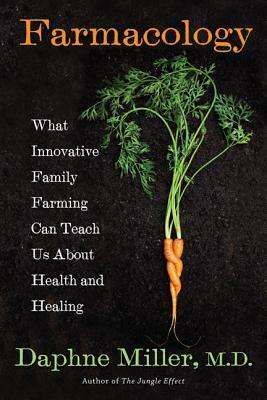 Hits all the right notes on healthy eating and the relationship between farm and healthy food. Easy to read and well presented with a story line, although the story line is slightly narcissistic. Ever since a high school biology teacher informed me that clover produces a hormone similar to human estrogen, I have been fascinated by how our external ecosystem is linked to our internal one. I am a practicing family physician, author and Associate Clinical Professor at the University of California San Francisco and mother of two nature-lovers. I'm also a contributing columnist to the Washingto Ever since a high school biology teacher informed me that clover produces a hormone similar to human estrogen, I have been fascinated by how our external ecosystem is linked to our internal one. I am a practicing family physician, author and Associate Clinical Professor at the University of California San Francisco and mother of two nature-lovers. I'm also a contributing columnist to the Washington Post as well as other newspapers and magazines. I received my medical degree from Harvard University and did my residency and a research fellowship at the University of California San Francisco.